What do you get from a $1,300 SSD? Intel's Optane 905P is extremely fast but not a contender for best value. So fast it glows radioactive blue. Or red or green. What could possibly get you to buy a $1,300 SSD that's only 960GB? If you're running servers, there are many scenarios that can justify such hardware, but for a gaming PC? Intel's Optane 905P 960GB goes beyond the realm of mere dreams and into the pure fantasy land of hardware. You'll be lucky if you have storage like this in your PC ten years from now. Getting right to the point, the 905P is screamingly fast in complex workloads. Overall, it rates as the fastest SSD we've ever tested, though it doesn't quite win every discipline. It's also not likely to run out of write cycles anytime in the next couple of decades, unless you're specifically trying to kill the drive. No drives were killed in the following math. Let me give you the math, because I like numbers. 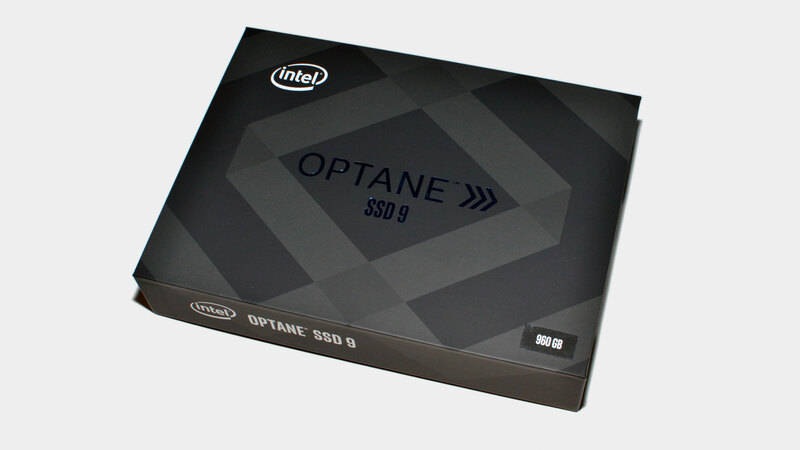 The Optane 905P, like its Optane 900P predecessor, is rated for 10DWPD, for five years. That's ten full drive writes per day. On the 280GB model, that's 2.8TB of data each day, every day, for 1,825 days. The 960GB Optane 905P takes that to silly levels of 9.6TB per day. Or if you prefer, it has an endurance rating of 17,520TB written. If all you do is write data to the drive, at maximum speed it would still take over three months. Theoretically, you could burn out a 1TB Samsung 970 Evo in about 3.5 days using a similar strategy. But no one is going to do that, unless it's intentional. Realistically, even workstation users aren't likely to write much more than 100GB per day on average, and many users will write far less. At 100GB per day, the Optane 905P 960GB would require 480 years to exceed its rated endurance. (And the capacitors or some other element would likely fail long before then.) I'm not sure what technology will look like two decades from now, never mind five centuries. The current PCIe Gen3 interface will be discontinued long before any real-world use could wear out the 3D XPoint cells. The design of the 905P is also updated, now with glowing LED lights. By default, the LEDs are blue, but you can change the color to red or green via Intel's SSD Toolbox. You can also turn them off it you don't like glowing lights, and no, they can't be individually controlled. Another change from the 900P that's not as cool is that you won't get a free copy of Star Citizen this time, which might make the 480GB Optane 900P a slightly more tempting option. Intel sits in the interesting position of being the only company that's currently shipping products using 3D XPoint Technology. Micron's QuantX drives were supposed to appear last year, but that didn't happen. Hopefully that changes in 2018. In the meantime, Intel sits unchallenged in the realm of extreme endurance. And performance is pretty good as well. Overall, the Optane 905P 960GB ends up beating its 900P predecessor by eight percent, and it's about 50 percent faster than the next closest drive that I've tested, the 1TB Samsung 970 Evo. The Optane drives do especially well in heavy mixed workloads, like the IOMeter sequential and random testing, which use the average throughput at 100/0, 75/25, 50/50, 25/75, and 0/100 percent mixes of continuous reads/writes, for five minutes at each level. The file copy test is similar, in that I copy (simultaneously read and write) the contents of a 20GB game folder onto the same drive. PCMark 8's Storage bandwidth result likewise echoes the extreme performance mantra. What about pure sequential read/write speeds, though? 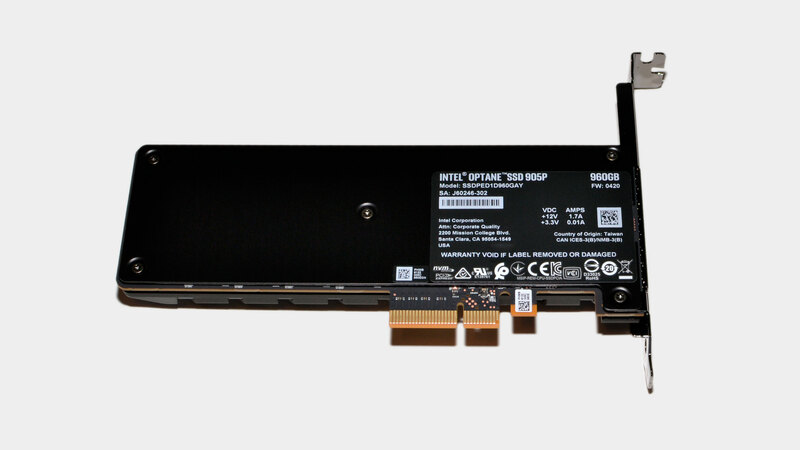 Rated at only 2,700/2,200 MB/s, the Optane 905P falls short of the fastest NVMe drives in both metrics, but those are less real-world and more theoretical in nature. The QD1 (queue depth 1) random read IO is another good showing for Optane and 3D XPoint, though QD1 write doesn't show as much of a lead. But do you really need this much performance, especially at the prices Intel is asking? The Optane 800P 118GB has a similar problem, with a price per GB that most PC users—especially gamers—will balk at. It costs $1.644 per GB at current street prices, and while the 905P 960GB does better at $1.353 per GB, it's a far cry from the $0.45 per GB of the Samsung 970 Evo 1TB, never mind the $0.28 per GB of the 860 Evo 500GB. Samsung takes the top spot for overall value (with a bias toward performance) on NVMe drives in the US, followed by the recent WD Black 3D. For the UK, the newcomer Adata SX8200 grabs top honors, followed by the Samsung 970 Evo and the WD Black 3D. (I'll be looking at the Adata and WD drives in separate reviews in the near future.) But Intel's Optane drives have never gone after the value segment. The passive heatsink keeps the 3D XPoint chips and controller cool. In practical use, we've easily exceeded the needs of most PC users with the latest NVMe drives. Yes, benchmarks show that some drives are faster than others, but I rarely notice the difference between any of the SSDs in the above charts when I'm just using my PC. The Samsung 860 Evo sits at the bottom of the chart, since it's using the old SATA interface, but anyone who owns such a drive will tell you that it works great. There's also the matter of the interface, with the 905P coming in AIC (add-in card) PCIe x4 form factor, or 480GB capacity only for U.2—with a planned 960GB U.2 model planned for the near future. M.2 drives go places that Optane 905P can't, like laptops. It's not a huge deal for most desktops, but these are clearly datacenter devices being repackaged in a slightly modified prosumer form. Do not open until 2025. More storage than you need. Intel's Optane 900P already offered irrational levels of performance, particularly when looking at the cost. The 905P doesn't really change things. If you're wondering what storage devices will look like in ten years, 3D XPoint or similar technologies (eg, phase change memory or memristor) are the most likely candidates. The only thing they really need is time—specifically, time for the manufacturing costs and R&D expenditures to be recuperated, and time for competitors to emerge. Once that happens, prices will start to fall, but in the meantime, we'll also move to faster interfaces like PCIe Gen4, maybe even Gen5. You could buy an Optane 905P today to get a taste of the future, but it's a very expensive taste and you probably don't need it. 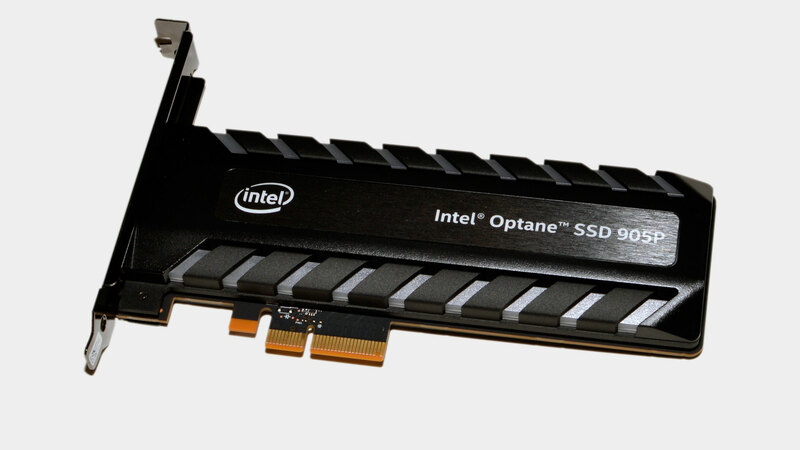 In fact, you might not even notice the difference between Optane 905P and a more mundane storage device like a SATA SSD. It's not that Optane isn't provably faster, but it comes down to what you're doing with it. If the way you drive your PC amounts to puttering around the city at 35 miles per hour or less, with lots of stoplights and traffic, being able to go 0-60 in 2.3 seconds and hit top speeds in excess of 200 miles per hour doesn't really matter. Optane 905P is so far beyond conventional storage bottlenecks that gamers and home users don't really need it. Few of us even think about wanting it. Now if you'll excuse me, I need to go install Final Fantasy 15 and the HD texture pack on the 905P—that's 159GB, or about $215 worth of storage. For science!